It’s always a joy to read Daniel Pink’s books. He has a knack for presenting Social Science research in an easy to understand way that makes it applicable to readers’ everyday lives. In his latest book When he picks timing as his topic and concludes: “I used to believe that timing was everything. Now I believe that everything is timing.” Let’s take a look at his main findings and see how we can time certain life activities to ensure better, more efficient and productive outcomes. Numerous studies show a distinctive pattern in most people’s moods and emotional states throughout the day. Happiness, positivity, and attention are on the rise in the morning, only to take a dip in the afternoon, before they rebound again toward the late afternoon and evening. (One study determined the most unproductive time of day to be 2:55pm.) Understanding of these patterns can have far-reaching repercussions for our daily lives. Some of the studies’ findings are just “nice to know,” but others can mean “life or death”. Knowing that taking a short (no longer than 40 minutes!) nap in the early afternoon can boost your productivity later on – that’s nice to know. But knowing that scheduling a medical procedure, such as surgery, for the afternoon will increase the risk of something going wrong 3- to 4-fold or knowing that juries and judges will evaluate evidence in trials much less rationally in the afternoon – that knowledge can potentially save your life! For best results, schedule medical procedures, academic tests, court trials, or important analytical tasks (or math class) for the morning. But, as always, there are exceptions to every good rule. When the task you need to tackle is not an analytical one but one that requires you to have insight or a creative spark, it’s best undertaken during our non-optimal time, the afternoon for most people. For academic schedules, this means that math and science classes are best scheduled early, whereas art and creative writing are best taught later in the day. According to research, the quintessential midlife crisis is real across genders, countries, and different socioeconomic groups. Numerous studies have shown that well-being and happiness slump in midlife and reach the lowest point at 52.9 years (for American males). Happiness begins to decline in the early 30’s, bottoms out in the early 50’s, and starts a steady climb after that. People frequently report higher well-being in their 70’s than in their younger years. While most explanations have traditionally centered on sociology, explaining that midlife is the phase of the realization of unmet life expectations and the corresponding disappointment, Pink also delves into newer research that alludes to the possibility of there being a biological component to the midlife crisis. Pink calls naps “Zambonis for our brain”. According to research “they smooth out the nicks, scuffs, and scratches a typical day has left on our mental ice”. Numerous studies from around the world conducted among different professions show the benefits of naps. For example, a NASA study shows that pilots who napped up to 40 minutes showed a subsequent increase of 34% in reaction time and a twofold increase in alertness. A UC-Berkeley study shows that an afternoon nap expands the brain’s capacity to learn and retain information as well as boosting short-term and associative memory. Nappers were twice as likely to solve a complex problem as non-nappers. The benefits of napping are independent of the amount of sleep people get at night. Even individuals that get enough nightly sleep still benefit from an afternoon nap. There is much more to this book than naps and midlife crises. Pink also elaborates on different chronotypes, the science of beginnings and endings, and group timing and synchronization. Interspersed with chapters are sections with real-life action points and tips and tricks to take advantage of the research of timing. It’s a fun and educational read with lots of life improvement potential. If you’d like to discover the science of timing, you may check out When from the East Baton Rouge Parish Library. If you’ve been thinking of going back to school in order to further your career, but you can’t quite afford it, this program may be perfect for you! EmployBR, in cooperation with the local Workforce Development Area 21, is providing educational scholarships. What kinds of programs are covered? Complete the EmployBR Scholarship Application. To qualify, you must be at least 18 years old and a resident of East Baton Rouge Parish. Completed applications must be submitted to EmployBR no later than ten (10) business days before training is scheduled to begin and not more than 30 days prior to it beginning. You will also have to apply for Federal Financial Aid. Submission does NOT guarantee scholarship award. how do i contact employbr? Have you ever encountered a difficulty, challenge, or trauma that was overwhelming to deal with? If you are human, chances are the answer is “yes”. 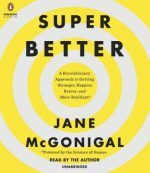 In her book “SuperBetter,” Jane McGonigal offers a new, fresh, and, in most eyes, unusual approach to overcome such situations. She uses gaming methodology to getting “stronger, happier, and more resilient”. If this turns you off and you think this is quackery, hold on. McGonigal, in addition to being an avid video game player and designer, is also a PhD and Director of Games Research & Development at the Institute of the Future. She has led workshops for numerous Fortune 500 companies and taught at UC Berkley and the San Francisco Art Institute. Her TED talks on this topic have been viewed more than 10 million times. Her SuperBetter methodology has been scientifically researched and validated by several universities and medical centers. While the SuperBetter approach is easy to understand and follow, the book is long and not a quick read. It is divided into three parts, and the reader does not necessarily need to follow them chronologically (though the book is worth reading in its entirety). Instead, you can pick and choose the parts that you are most interested in. Not surprisingly, the book is full of gaming terminology. That makes it easy to understand and fun to follow. It is simply part of why this approach works. Throughout the book you will find more than 50 quests to complete. Those quests represent the real-world applicability and interactive qualities of the book. Of course they are fun too. Follow along and complete the quests, like in a game; they start off very easy and will get more and more involved. The quests address one of four areas: physical, mental, emotional, and social resilience. Through those quests you will gamefully address and manage your life challenges. The first part of the book is a detailed overview of the science of games and presents evidence on why they work in alleviating physical and mental pain. It’s fascinating to read how games we all know and which are easily available on a smart phone can benefit our well being (Tetris and Candycrush for example). This part of the book also discusses what it means to be gameful. Being gameful is the state of mind we are in when we play games and it is key to why games are successful in helping us cope. McGonigal defines gameful as “bringing psychological strengths you naturally display when you play games – such as optimism, creativity, courage and determination – to your real life”. Whenever we approach life’s hurdles optimistically, courageously, determined, and creatively, we stand a much higher chance of prevailing. While being gameful, these seven chapters address physical, mental, emotional, and social challenges, how to approach and cope with them. The final part of the book consists of three adventures addressing issues of relationships, body image, and time management. McGonigal defines adventure as “a set of power-ups, bad guys, and quests, designed to help you tackle a particular challenge”. In other words, this chapter represents three full tutorials of how to apply the SuperBetter method to problems in these three specific areas. This also serves as a blueprint to design your own adventures for challenges that you are facing and need to get SuperBetter at. Overall this book is well worth reading all its 425 pages (warning: take your time, it is not a quick read). McGonigal’s truly unique (and scientifically validated) approach will surely help people address serious real-life issues from a new angle. If you follow along and complete the quests and adventures while you are reading, you will have gained new coping techniques by the end of the book, guaranteed. For those readers already well versed in gaming terminology and methodology, go ahead and jump right into the quests. For all others, the methods in the book will represent a change in mindset about problem-solving, which is itself a worthwhile effort. Become a Cybersecurity Analyst in just 15 months, at no cost to you. You will get paid while you train through this new apprenticeship opportunity sponsored by NexusLA and Apprenti. 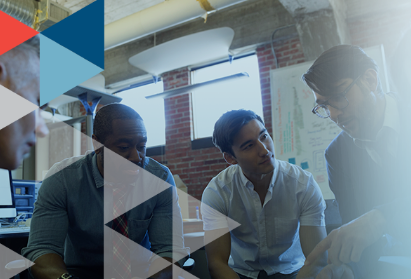 Cybersecurity Analysts are in high demand in our area and companies such as Blue Cross Blue Shield of Louisiana, EATEL, TraceSecurity, and General Informatics have already agreed to hire apprentices through this program (Apprenti). Apprenti is a new registered apprenticeship program to offer you a path and plan into the tech industry. You need to be over 18 with a high school diploma or equivalent and eligible to work in the U.S. (you do not need to be a U.S. citizen). Take the test at https://apprenticareers.org/locations/louisiana/ and see if you make it to the next round. If you don’t succeed the first time around, you can retake the test 3 more times. Do you want to learn more about computer applications to help you in your job search? Or have you started a job in which you are expected to use certain computer applications?Then take a look at Hoonuit. Hoonuit is an online platform that provides “on-demand software training and support tutorials to help businesses and organizations fulfill staff technology training and development goals”. Patrons of the East Baton Rouge Public Library can access Hoonuit through the library’s Digital Library. The computers inside the East Baton Rouge Parish Library will connect automatically, but if you are at home, you may need to type in your library card number. You will need to Create a New Account if you do not already have an account with RB Digital. The account is free. Once you enter Hoonuit you will see a welcome page. 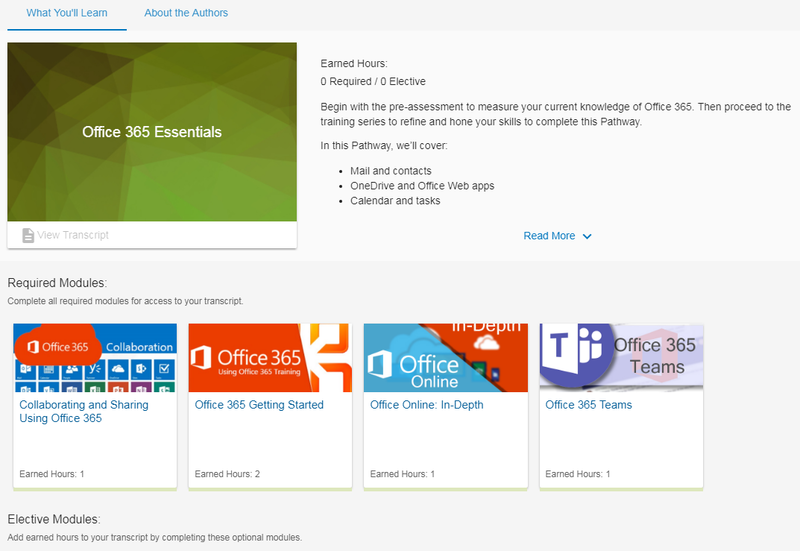 The screenshot below shows “Pathways” which are like online courses focusing on a particular topic or software suite such as Word 2016 or Office 365. These courses include modules, each of which includes a series of short training videos that describe a specific aspect or feature of that software. As you can see, the videos are very brief. They teach by showing actions within the application along with a voice over by an instructor who explains what you can do within that application and how. Important – There are many videos on topics and software applications that are not listed under Pathways or Topics – you must search for them. Hoonuit offers over 50,000 videos on an impressive array of applications, including applications that are less well known but can be useful, such as Audacity, Gimp, Moodle, and OpenOffice. You can access Hoonuit through a web browser on a computer, or on your smartphone or tablet using the RB Digital app. Explore Hoonuit and expand your computer skills today! This is the first post is a series delving into the various aspects of the Career Cruising database available through the East Baton Rouge Parish Library’s Digital Library. Read all posts here. Career Cruising is a database that’s a very user-friendly one-stop-shop for all things related to college, career, and job search information. All you need is an East Baton Rouge Parish Library card and a computer with internet connection. Want to find out which university in your area offers a criminal justice major? Career Cruising can do that for you. Want to find careers that don’t need a 4-year degree but pay more than $60,000 a year? Career Cruising can do that (it identifies 20 occupations for these criteria, among them commercial driver, energy auditor, landman, and mortgage broker). Want to know exactly what an actuary does and what it takes to become one? Yes, Career Cruising has that information too. Need to find scholarships to pay for college? Again, check Career Cruising. 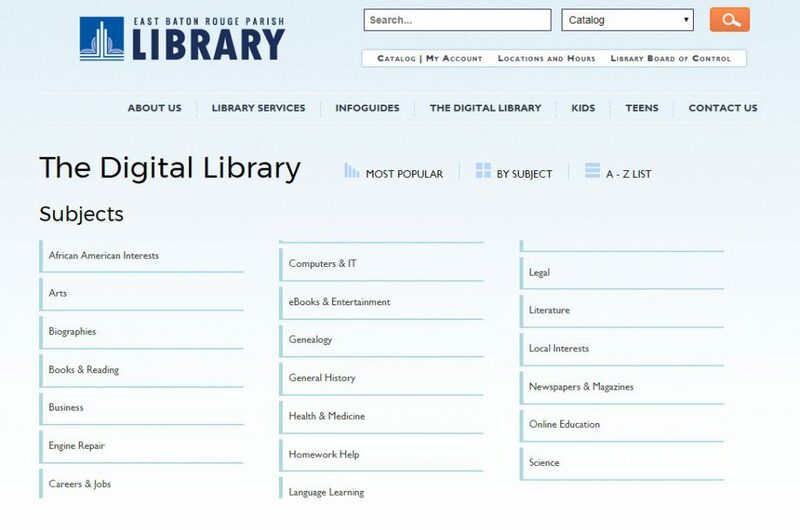 You can access the database through the EBRPL Digital Library, which will take you to the Career Cruising home page. Career Cruising presents ample information divided into five tabs: Assessments, Careers, Education, Financial Aid, and Employment. You can browse all information without creating an account (except for the assessments and the resume builder — for those you will need an account). While you can use most functions without an account, the database will not save any of your activities and you will have to start over the next time you access Career Cruising. 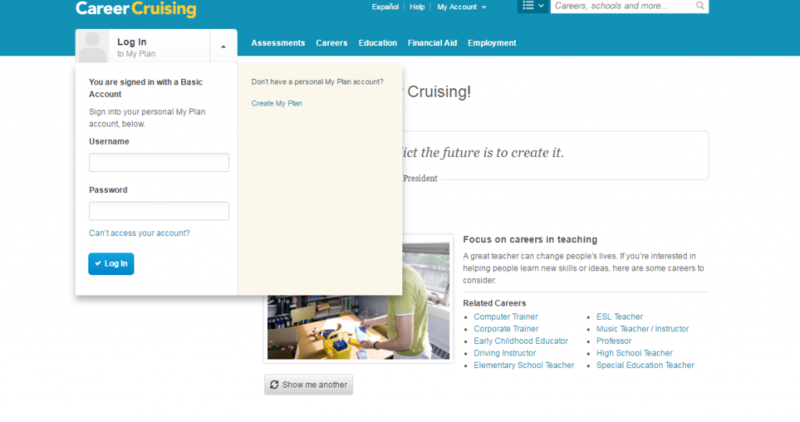 It’s better to create a “My Plan” account with Career Cruising to save your assessments, education plans, and searches. This way you can come back, view your earlier activity, and continue where you left off at any time. Now you are ready to plan your college or career journey. Not sure about your skills and interests? Start with an assessment. You can take the “Matchmaker & My Skills,” which assesses your interests and matches them with occupations, or the “Learning Styles Inventory,” which measures how you learn best and retain information most efficiently — valuable information for planning your further education. 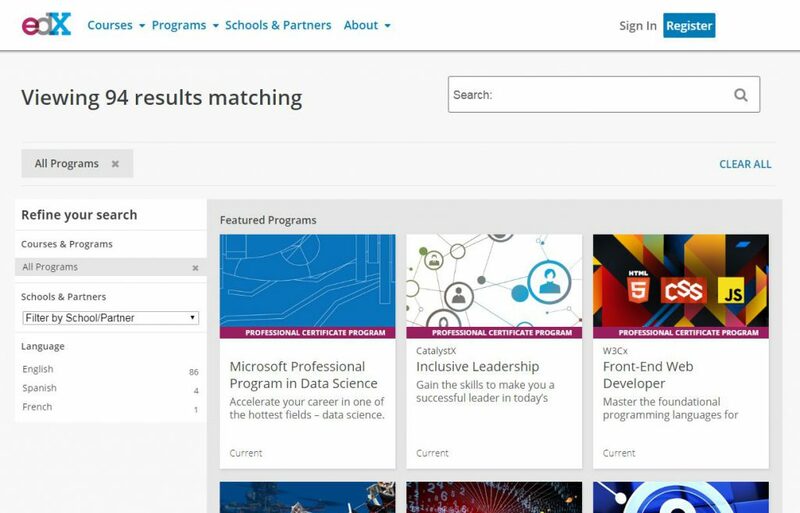 You can either use your assessment results to research matching careers or skip assessments and jump into the careers tab right away. The careers section is such a treasure trove of easily accessible information that we will explore it in more depth in a future post. For now, here is an overview of the kind of information you can search for. You can search for occupations alphabetically or by school subject, which will present you with careers related to your favorite school subject. 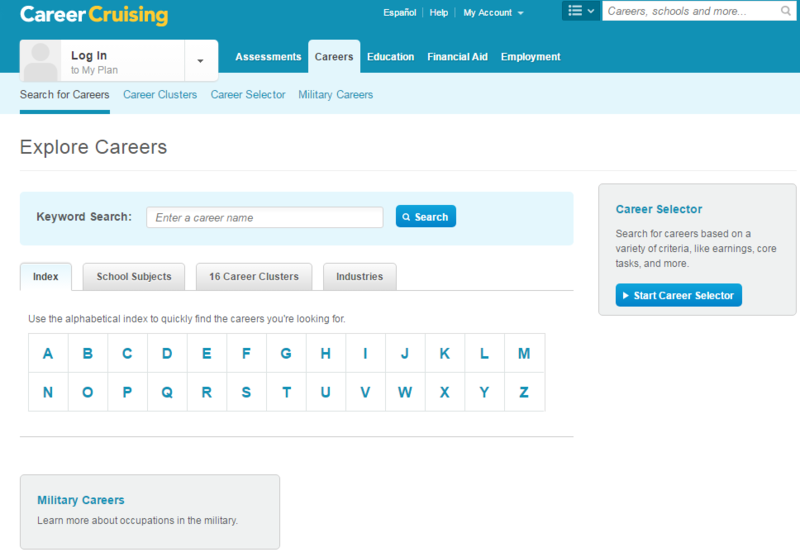 You can also look at occupations by career cluster and by industries, and there is a separate section with explanations of military careers. Additionally, the Career Selector is a tool that lets you choose specific criteria, such as salary, core tasks, and education level, and matches those to occupations that fit your criteria. The education section is also a one-stop-shop. You can search for universities by region or by major. You can conduct side-by-side comparisons of schools in terms of majors, size, cost, etc. And the database can give you a planning timeline by major, which will tell you which classes you should take in high school to best prepare you for your chosen major. Now that you’ve chosen a college, you are ready to find scholarships. Use the Financial Aid tab to search among thousands of scholarship opportunities. You can use the alphabetical index to search according to scholarship name. Or you can use the Financial Aid Selector and search according to your specified criteria. For either search method, the result will give you a full scholarship profile and a link to the respective website. 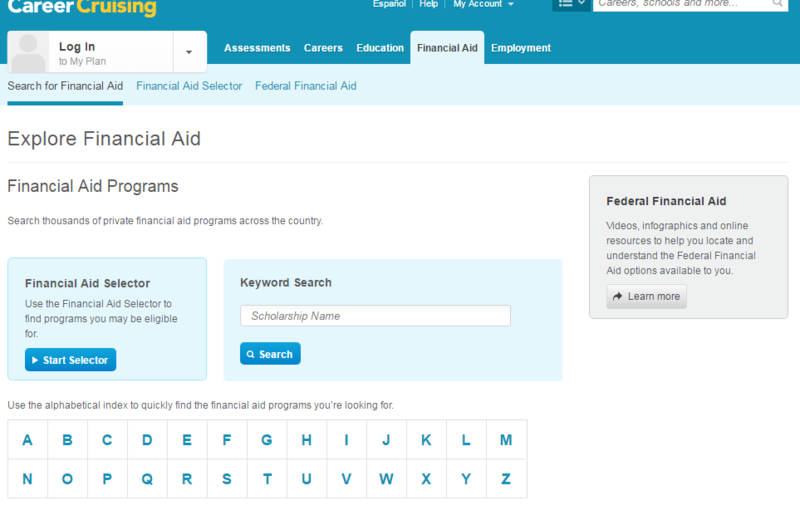 The site also features information about the Free Application for Federal Student Aid (FAFSA). 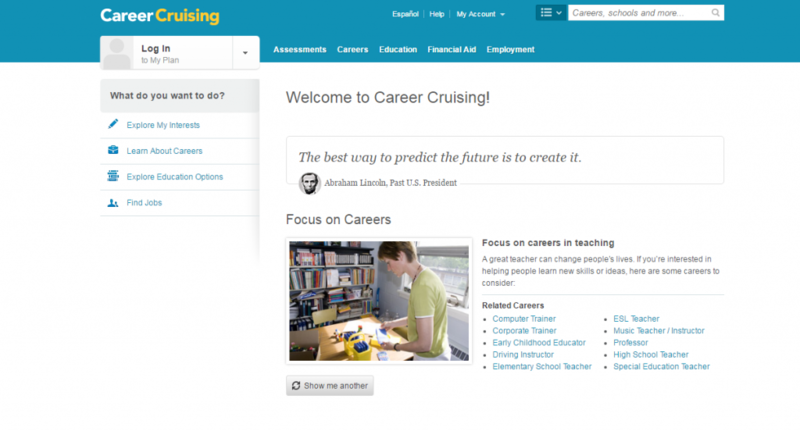 Last but not least, Career Cruising can help with your job search. Under the Employment tab you will find links to information about job search skills such as cover letter writing, interview preparation, resume writing, etc. There is a job search feature that links you to www.indeed.com, a job postings aggregator that helps you find open positions in your field and location. 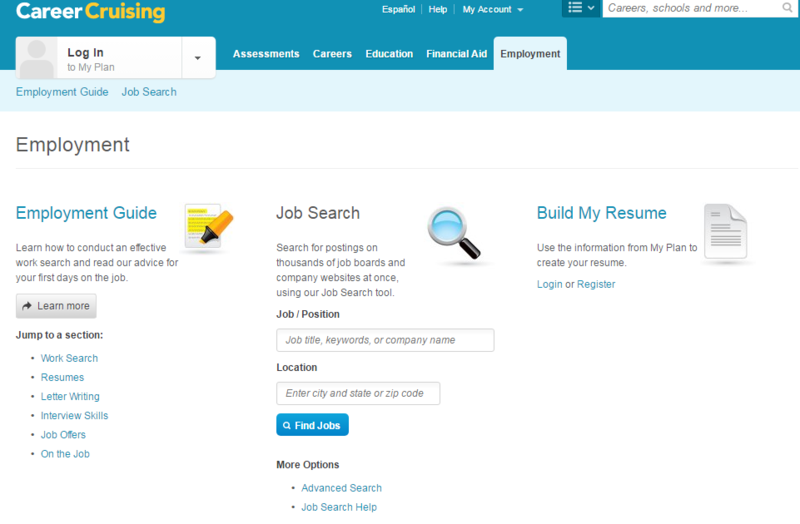 To help you write a winning resume, Career Cruising also features a “Build My Resume” tool. There is such a wealth of information in this database that this article can only scratch the surface. 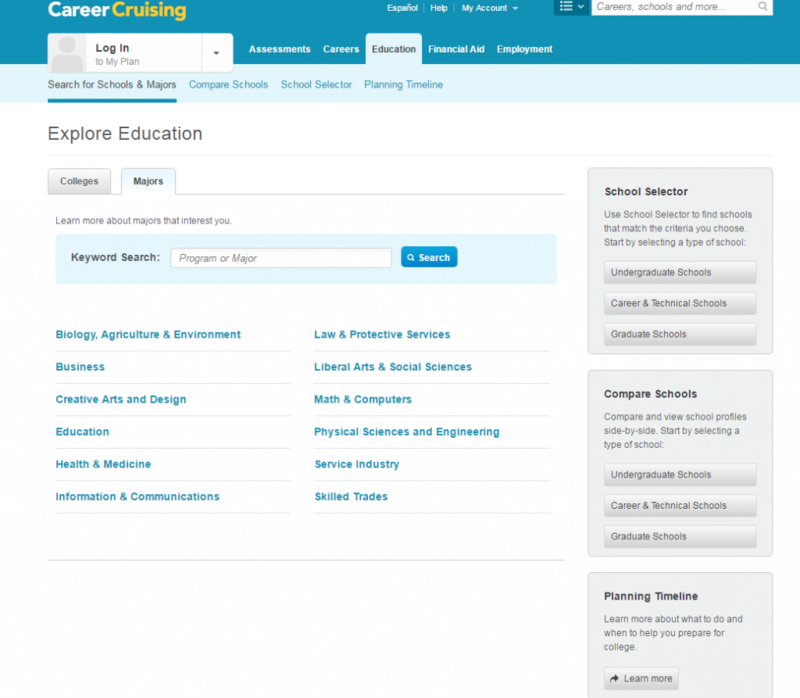 Career Cruising is intuitive and user-friendly, so you will do fine just logging on and browsing the site. However, we will follow up with future posts elaborating on each section of this database. Do Yourself, Your Career, and Your Employer a Favor — Take a Vacation! Americans work hard and they don’t like, or more accurately, don’t dare, to take time off. 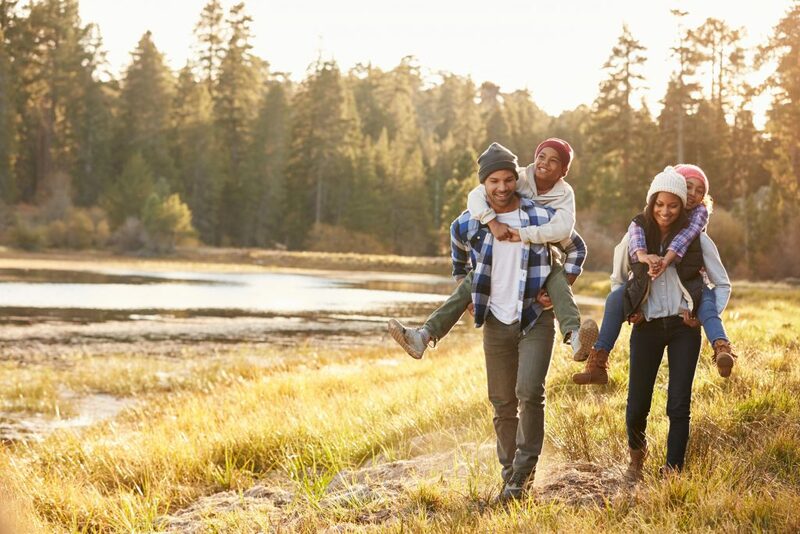 A study by Project: Time Off, an initiative by the U.S. Travel Association, reports that in 2015, 658 million vacation days went unused, and for 222 million of those, employees received no compensation for these unused vacation benefits. The reason cited most often by employees is that they feel there is too much to do and that there will be a mountain of work waiting for them upon their return, making the vacation not worthwhile. Also, company culture often doesn’t encourage taking time off. Instead, it is the employees’ perception that the more time they spend at work, the more successful they will be. Is this healthy? No! Is this productive? No! Is it possible to do this differently? Yes! Let’s see what taking time off can do for you. Stress reduction: Vacations reduce stress by removing people from situations that are associated with stress and anxiety, according to a study by the American Psychological Association. Other studies have shown that employees who take time off complain of fewer stress-related illnesses, such as headaches and backaches, once they return to work. Heart disease prevention: A number of studies have shown that taking time off can decrease your risk for heart disease. One study showed that women who took a vacation only once every six years were eight times more likely to develop heart disease than women who took at least two vacations a year. Strengthened immune system: Since too much stress and overwork negatively affects the immune system, the rest and relaxation associated with time off will likely lead to strengthened immune systems — and fewer days of work missed due to sickness. Taking time off is not only good for you, it is also good for business! Research shows that when done right, time off will increase your energy level and happiness, which translates into higher productivity. Incidentally, many of the countries with the highest labor productivity are also home to employees that take most of their very generous vacation allowances (e.g. Switzerland, Netherlands, Germany). Taking more time off can lead to better job performance and faster promotion. An internal study at professional services firm EY has shown that for every additional ten hours of vacation that employees took, their year-end performance ratings improved by 8%. According to Project: Time Off, people that use all of their vacation time have a 6.5% higher chance of getting a raise and/or getting promoted than employees who decide to let 11 or more days of their leave lapse. A word of caution, the relationship established in this study is correlation, not causation, but it is an interesting notion nonetheless. However, beware — a poorly planned or poorly executed vacation can achieve the opposite effect: you will return to work even more stressed. Therefore, plan your time off wisely. Plan and coordinate with your colleagues ahead of time to avoid that huge mountain of work waiting upon your return. Most importantly, relax and recharge. Now have fun planning your 2017 vacations! 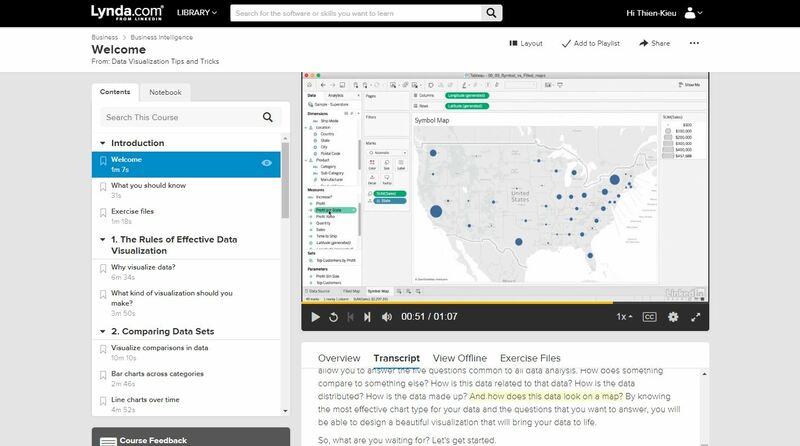 Lynda.com is an online education platform that offers thousands of video courses to help you learn a broad array of skills, including software, creative, and business skills. 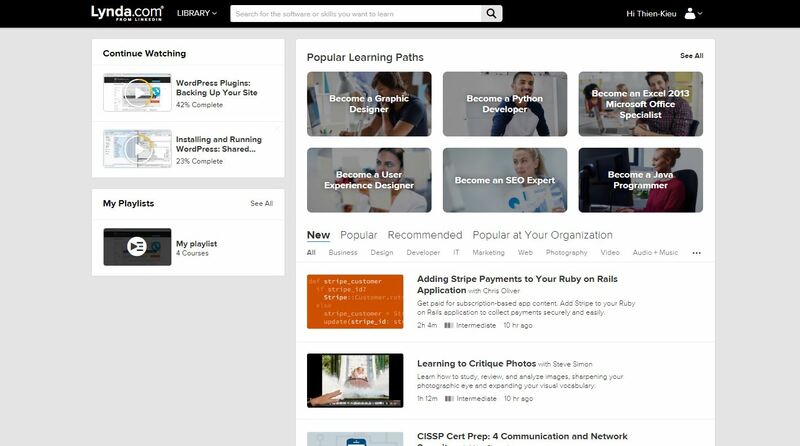 Within the Lynda library, you can browse courses by topic, software, or learning paths. Let’s take a look at some of the courses available on Lynda. 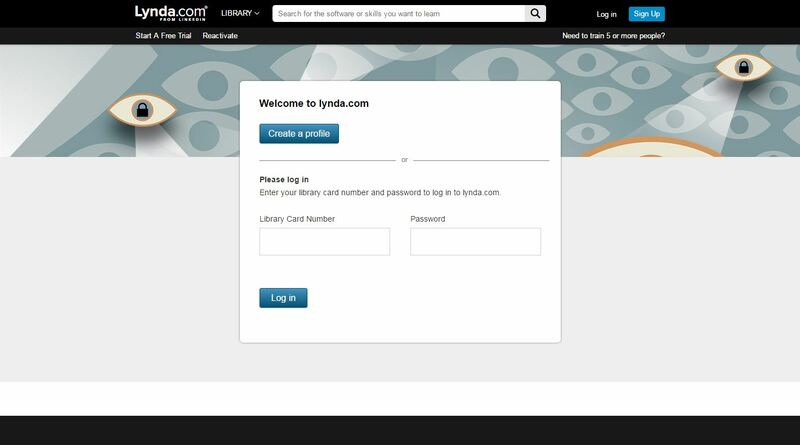 Access to Lynda is free for East Baton Rouge Parish Library patrons with a library card, and you can sign into Lynda through the library’s Digital Library. 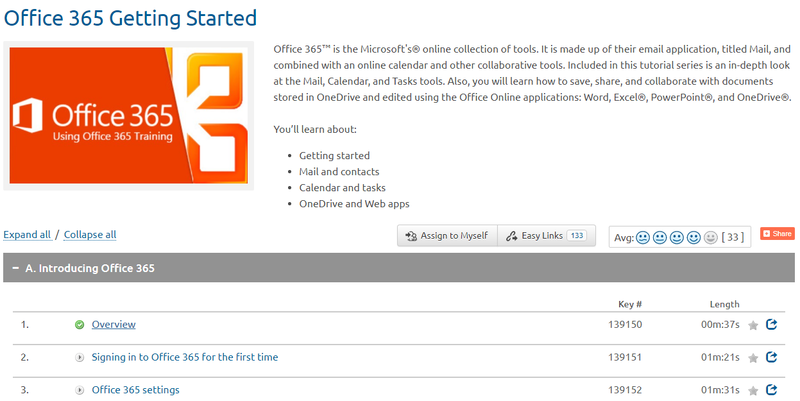 Once logged in, you will see three sections. 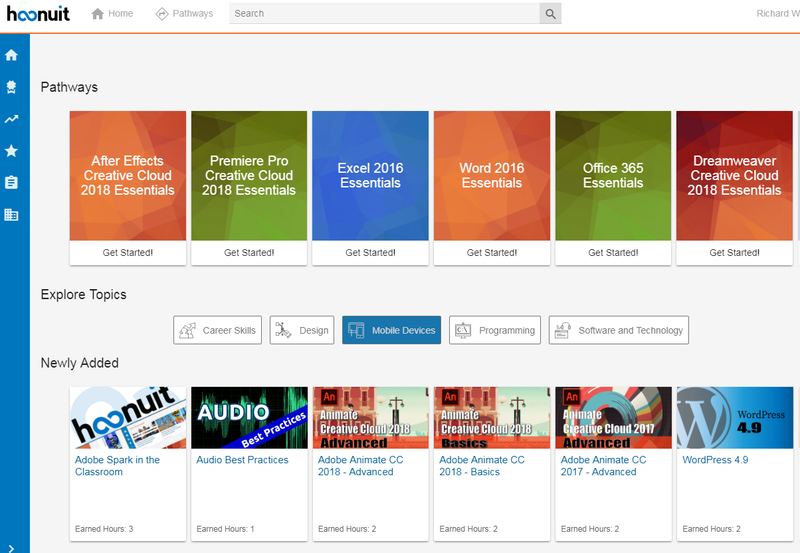 The top left section gives you quick access to courses you were most recently viewing. Below that is the “My Playlists” section. You can add courses that you are currently watching to the playlist as well as save courses for future viewing. 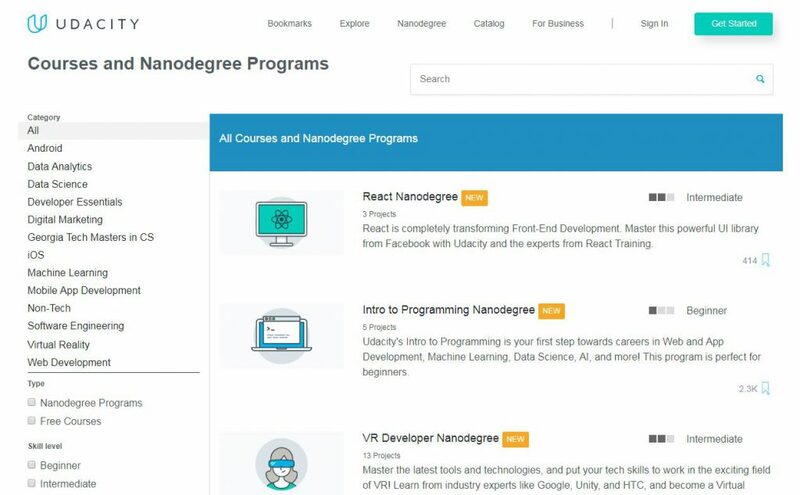 This way all the courses you’re interested in are located in one place, and you don’t have to search through the Lynda library for them again. The third, and largest, section features courses. Here you can see courses that have been recently added as well as popular and recommended courses. 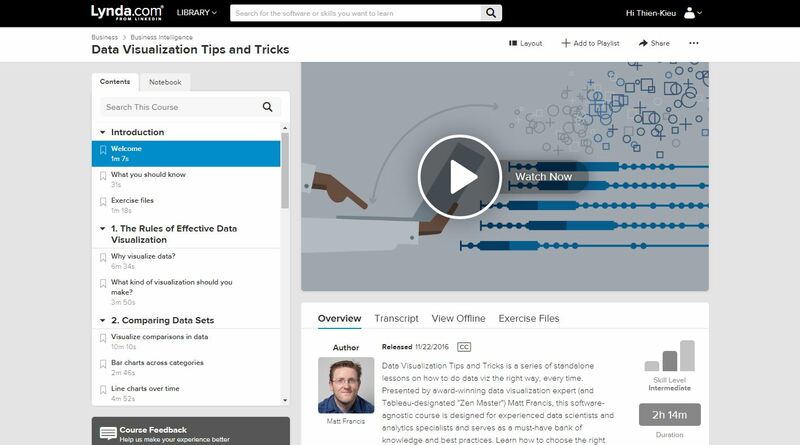 When you are viewing a course — in this case “Data Visualization Tips and Tricks” — a contents section appears on the left. Here you can see the the progression of lessons and the length of each video. To the right of the contents is the video, and the section below the video gives further information and options, such as a transcript of the video and the option to download the lesson to view later, which is great if you know you’ll be somewhere without internet access. So are you ready to start learning? Which course will you watch first?